This recipe describes how to use the GeRT to recover mildly saturated sources in your MIPS-70 data. MIPS BCDs are created from the raw data cubes by calculating the slopes of the data ramps for each pixel. For more information about this, see the MIPS Data Handbook and Gordon et al. 2005 (PASP, 117, 503). Normally the BCDs use at least 4 samples to calculate the slope of the ramp, but if the pixel in question saturates before the last of these 4 samples, the pixel is flagged and masked in the BCD frame. The GeRT can be adjusted to re-make the BCDs using fewer samples, so, for example, pixels that are saturated at 4 samples, but not at 3, are recovered. The GeRT can generate BCDs using as few as 2 samples. WARNING: changing the number of samples used to calculate the slope of the data ramp will affect the calibration of the data. You must read the 70 micron calibration paper (Gordon et al. 2007, PASP, 119, 1019) if you intend to use the GeRT to recover saturated pixels in your scientific data. Obviously there are limits to the correction - pixels that are saturated before the second sample in the data ramps cannot be recovered, and so the GeRT can only work in cases of mild saturation. Here we describe how to re-create the BCDs using only 2 data samples to calculate the slope of the data ramp, so recovering the flux information from pixels that are mildly saturated in the postBCD image. You must have MOPEX (http://irsa.ipac.caltech.edu/data/SPITZER/docs/dataanalysistools/tools/mopex/) and the GeRT (http://irsa.ipac.caltech.edu/data/SPITZER/docs/dataanalysistools/tools/gert/) installed in order to follow along with this recipe. You can download the example data for this recipe from the SSC web site:� (http://irsa.ipac.caltech.edu/data/SPITZER/docs/dataanalysistools/cookbook/files/mips70_saturation_recipe_data.tar). You will need 435 MB of free disk space in order to follow along with this recipe. Download the example data via the link above, move the tarball into a clean working directory and unpack it. This should create 2 subdirectories labelled pbcd/ and raw/ containing the post-BCD mosaics and associated raw files from the Spitzer archive. The raw files provided in the tarball are a subset of the entire mosaic (to cut down on required disk space), so the final mosaic you create with these data will be smaller than the mosaicked image in the pbcd directory. Open the MOPEX GUI and open the post-BCD mosaic, called pbcd/SPITZER_M2_20484608_0000_2_E3045040_maic.fits to see the final archive product (go to Image > FITS File Image). You can also do this in the image viewer of your choice (e.g. SAOImage DS9), but be aware that pixel NaN values (which show the position of the saturated data) show up as white in many viewers, rather than black (as in MOPEX) and so will not be immediately apparent. This will bring up a dialogue box. 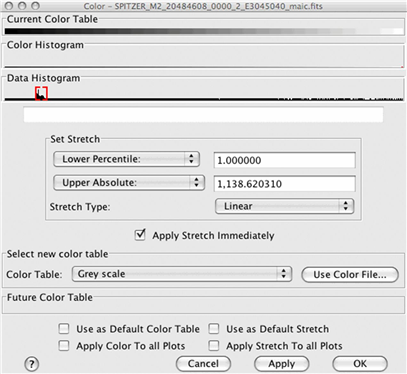 In the "Data Histogram" slider, drag the right-hand red bracket towards the left-hand side until you start to see the background detail appearing in the image. The small black spots in the areas of extended emission are areas of saturation. 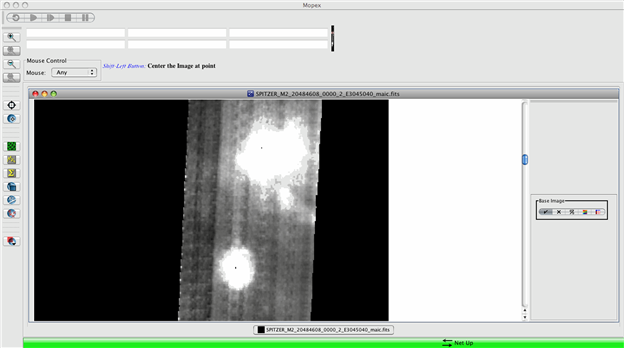 If you run your cursor over them, you will see that the flux value shown in the top left-hand corner of MOPEX disappears for those pixels (NaNs in the data). We will use the GeRT to re-make the BCDs to correct for these. Important: your edits must include a space either side of the "=" sign, and must include the comma at the end of the line, else your changes will not be read. Once you have made these changes, save the file. If this is the first time that you have used the GeRT, follow the setup instructions before going any further. The instructions can also be found in the GeRT installation directory (file called READme). Once the GeRT is set up, return to your working directory raw/. If you see any error messages then check the GeRT setup instructions to make sure that you have set the GeRT up correctly. SLOPER Processing done. 293 dce's in 273 seconds. 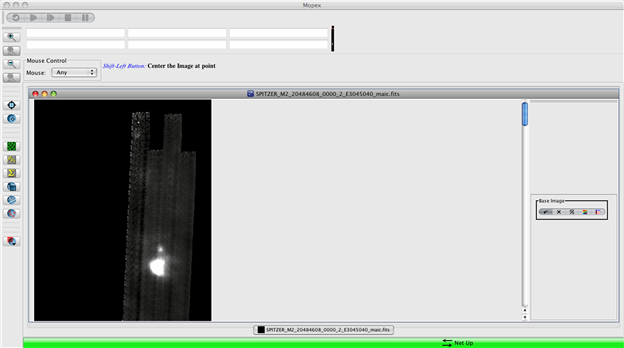 CALER Processing done, BCDs in ../OUTdir/bcd processed in 29 seconds. Now remove all of the stim flash frames (all frames with header keyword STMFL70 = 1 are stim flash frames and should be rejected), and check that all of the data frames were taken with the 70 micron array as the prime array (PRIMEARR = 1; reject any frames with PRIMEARR = 2 or PRIMEARR = 3). 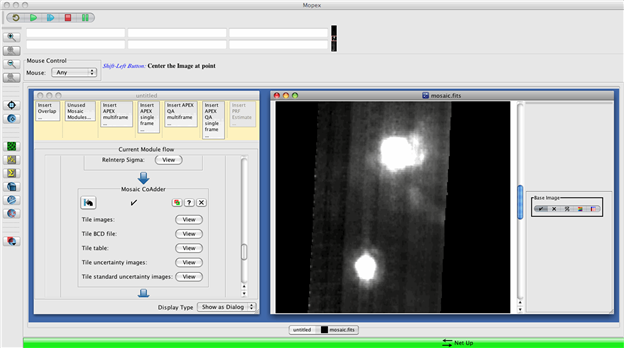 Once you have created the input lists, start the MOPEX GUI and load the Mosaic template for MIPS-70 data (go to File > New Mosaic Pipeline > Mosaic, 70 microns and hit "ok"). Set up the flow by setting the Image Stack File to point to the new list of BCDs, imagelist.txt, and choosing an Output Directory. Be patient when trying to load the Image Stack File - the directory contains a lot of images, and it can take a while for MOPEX to load the directory contents into the file selection window. Next you need to click on "Optional Input and Mask Files" and set the Sigma List File and the DCE Status Mask File to point to your sigmalist.txt and masklist.txt files, respectively. Again, be patient as it takes a while for MOPEX to display the directory contents. The Pmask FITS File should be set to the MIPS-70 PMask file found in the cal/ directory of your MOPEX installation (/your/mopex/directory/cal/mips70_pmask.fits) but the remaining input files can be left blank. Click "OK" and then start the flow running by clicking on the green "play" arrow in the top-left corner of the MOPEX window. Again, be patient when waiting for the flow to start. Once the flow has finished, you should have a mosaic that looks like the one below, where you can see that the previously saturated areas of the extended emission regions now look good. REMEMBER - following this procedure will have affected the calibration of your data. Do not publish data processed in this way without first reading the MIPS-70 calibration paper (Gordon et al. 2007, PASP, 119, 1019). Obviously, the background for this image is far from perfect, and additional processing will need to be done in order to correct for bad stim flash calibration and to refilter the BCDs to optimise them for photometry on extended objects. See the recipes ��GeRT: Bad Stim Flash Correction in MIPS-70 data� and ��GeRT: Filter Extended Sources in MIPS-70 data� for step-by-step instructions on how to do this. Refiltering the data to optimise for extended sources is only recommended if you are not interested in diffuse background emission such as the ISM.